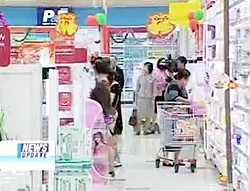 BANGKOK, 6 September 2011 – Five groups of industrial entrepreneurs have agreed to reduce product prices after the government has reduced oil prices while entrepreneurs of household goods, food and beverages have promised to peg product prices until the end of this year. According to Deputy Commerce Minister Poom Sarapol, five out of ten groups of entrepreneurs have agreed to reduce product prices within this week after the oil prices have been reduced in order to help people, especially those suffering from flood. Price changes will be seen in five goods namely cement (reduced by 5-10 baht from 135-140 baht per one 50-kilogram sack), roof tile (reduced by 5 baht from 36-40 baht each), chemical fertiliser (reduced by 5-8 baht from 905-1,000 baht per one 50-kilogram sack), water pump (reduced by 100-200 baht from 4,590 baht each) and wheat flour (reduced by 10 baht from 477-698 baht per one bag). Meanwhile, entrepreneurs of many other goods said they could not reduce prices as they have already made annual contracts with transport companies; therefore, their transportation cost would not decrease although the oil prices have decreased already. Entrepreneurs in this group are those manufacturing household goods such as detergent, soap, toothpaste, food and beverages, instant noodle, canned fish, etc. They however promised that they would pin their product prices until the end of this year.